The multi-channel sound system group is implementing a spatial instrument that allows us to interactively experience sound in space. 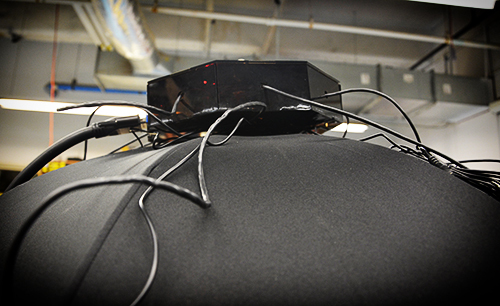 The system includes software that controls a set of eight (currently) speakers that are positioned in space. 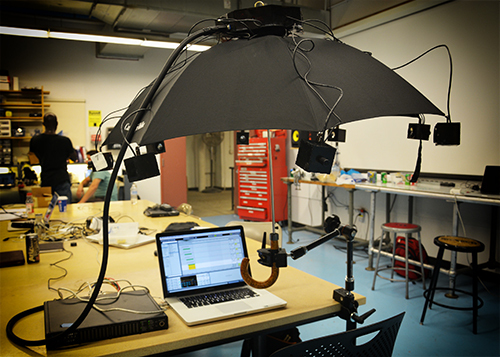 We have two hardware setups for our project: the first is an umbrella that the speakers are mounted on, in which the listener sits beneath. The second is a wooden disk that is suspended from the ceiling. This setup allows the user to spin freely between the speakers. We have improved on the existing Suspended Motion project by incorporating our eight channel setup. Images from this new setup can be seen below. 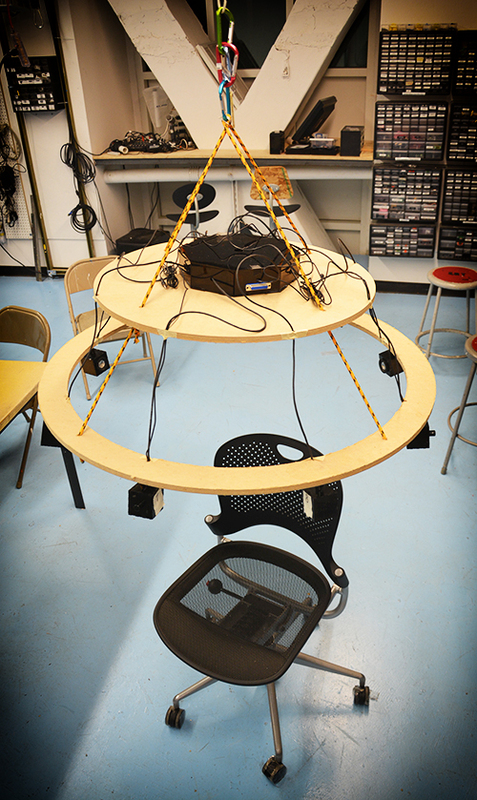 We are also still in the process of finding a chair that optimizes the experience. Many of the chairs we have tried are noisy or do not spin as freely as we would like. A complete description of the Suspended Motion setup and experience can be found here: teach.alimomeni.net/2013fall2/?p=2559. 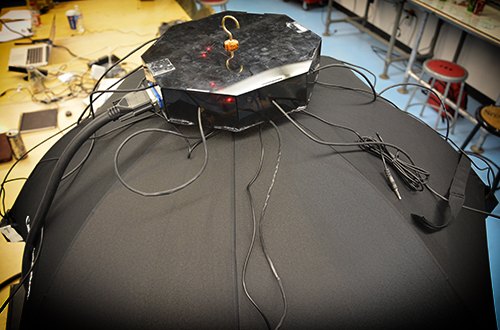 This experiment involves using the eight speaker setup to test our hearing sensitivity. We start with slow impulses rotating around the circle, and these impulses gradually accelerate until it’s difficult to distinguish which direction the sound is coming from at any given instance. 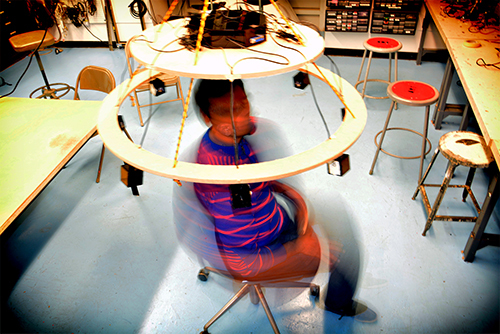 In Sonic Sculptures, the user is immersed in a sound environment that they quickly discover they can manipulate with their gestures. They learn to interact with the environment to make a new composition, or they can sit and listen to their environment objectively. 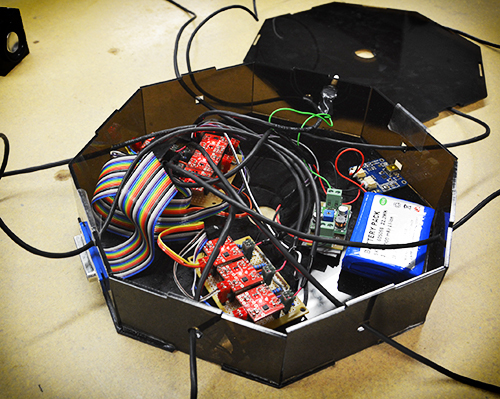 We’re currently using iPhone gyroscope, accelerometer, and compass data, and are also looking into using kinect data. In both of our setups, we have tried to make our system robust enough to take out on the road! We’ve made acrylic enclosures for all the speakers, as well as designed an acrylic amplifier box which houses an amplifier array along with a charging circuit and a Li-ion battery. The battery powered amp-box gives us the mobility we’d like to make use of later. All wiring and circuits have been shifted from the breadboard to stripboard/veroboard and everything has been kept modular to allow quick assemble/dis-assembly. For the disk setup, all hardware is mounted onto a flat wooden surface as shown in the pictures above. Finally, shielded speaker wires were used to avoid any cross-talk.